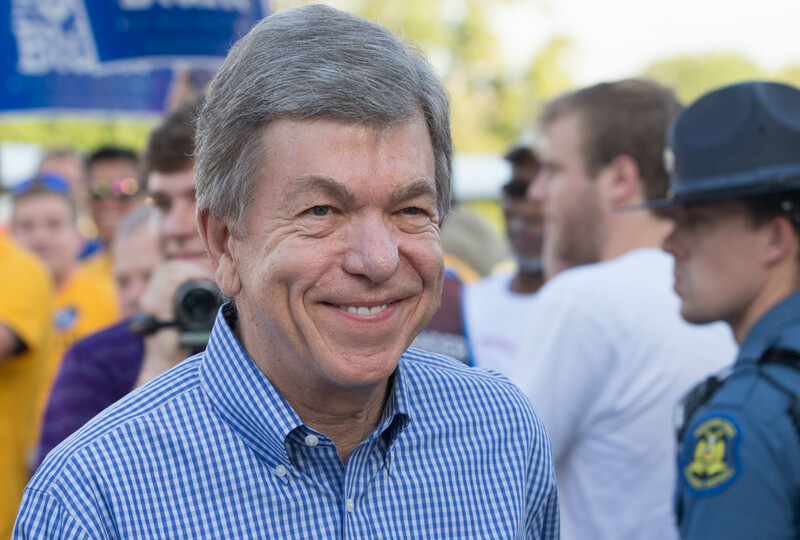 Sen. Roy Blunt (r): Guess who’s coming to town? Donald Trump is coming to Springfield, Missouri on Wednesday. Senator Roy Blunt (r) is pleased. 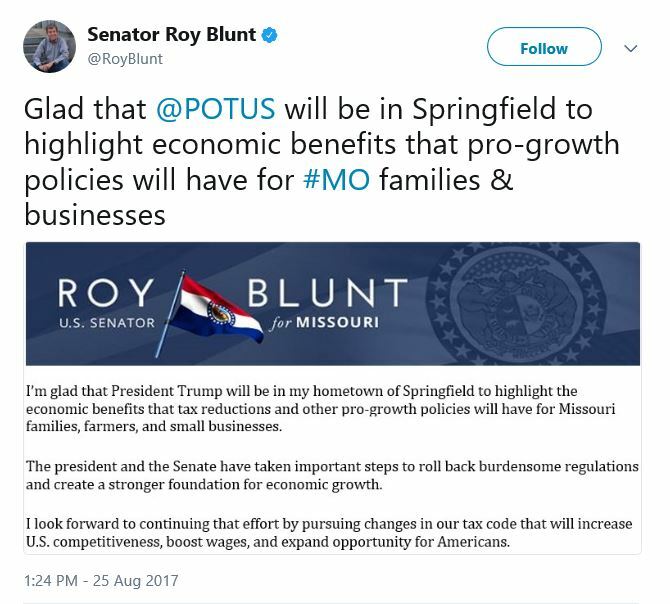 I’m sure that POTUS will cite the huge benefits Missouri and Kansas have experienced with all the tax cuts. Wonder which trump will show, teleprompted or unhinged. We know which Roy will show, grinning lap dog. Are you sure? Or, is he going to rant about “fake” news and perceived slights from fellow GOP members for 77 minutes? Mexico will provide the tax plan. Maybe you should be encouraging him to focus Harvey and try to staff FEMA instead of coming here to stroke his ego and lie to us. MO doesn’t need to hear about the tax policies of a man who won’t release his taxes. He and his bigot brigade are not welcome here. Praying for Texas enduring Harvey and MO enduring Donald. Makes sense. Springfield is Klan country. Have the moral integrity to stand up to trump. He is ruining the Republican party. With Arpaio pardoned, you are welcoming a man who continues to come out on the side of racism #notmypresident #ImpeachNow Silence tells all. Senator @RoyBlunt, how can you trust any @POTUS appearance to not turn into a rambling rant about nothing in particular? This will be a great photo op for Roy. Everyone knows Roy loves photo ops, unlike his fear of town hall meetings. tRump talks Roy language. I’m not glad. And newsflash: trump doesn’t give a rip about working families anywhere. Senator Blunt – you will be remembered for enabling a President who consistently chooses the morally indefensible. Your continued support of Trump puts you on wrong side of history. You continue to put party and self-interest over best for Missourians. The only reason he’s coming to Springfield is to campaign. He has no interest in Missourians. “Burdensome regulations” like the EPA rule preventing toxic coal ash being dumped in waterways. Great job letting your rivers be polluted. There will be no redemption for you if you stand in support of this white supremacist. We will know without a doubt where you stand. You can hold KKK rallies but not town hall meetings? Your support for the modern world’s most prominent Nazi has been duly noted. Sad that Senator Blunt is a shameless, spineless sycophant to a racist POTUS.